I set up an integration with FFA, i didnt install the bundle for PSA, however when i perform the connection with my sandbox environment, it tells me that the connections is with PSA. So, i deleted every package from my sandbox completely, deleted the connection with expensify and FF and try again, but the result was the same. Anything im not seeing in here? Hmmm, currently if you're using Financial Force PSA, you can't actually connect to FFA alone - only PSA. 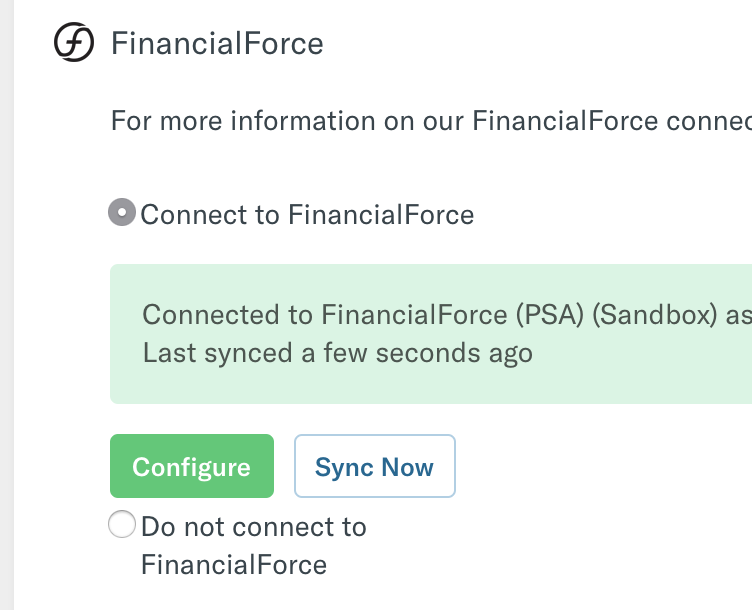 Are you using PSA on FinancialForce? If so, we do have an ongoing internal discussion about whether we'd like to add the ability to choose the ability to only connect with FFA rather than PSA, and I'll add your request to that. Yes, actually we would like to be able to chose FFA or PSA depending on the policy that we are using. This is not possible at the moment? It's not possible right now I'm afraid @gpinto! You're now first in line to hear about it if we do though.